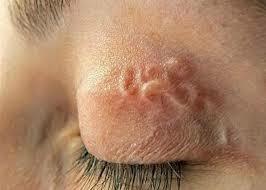 Dirofilariasis in humans is caused by Dirofilaria roundworms. The main natural hosts for the three Dirofilaria species that most frequently cause disease in humans are dogs and wild canids (such as wolves and foxes) and raccoons. Humans are infected with Dirofilaria larvae through mosquito bites. Infection can result in nodules under the skin or conjunctiva and lung granulomas that appear as coin lesions on x-rays, leading to diagnostic procedures to exclude more serious diseases. 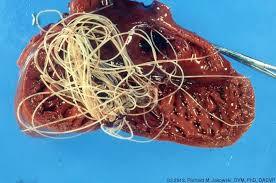 The Dirofilaria species that most commonly cause human infection are D immitis (heartworm) and D repens. It is transmitted to humans through arthropods; mosquitoes are the vector for Dirofilaria. 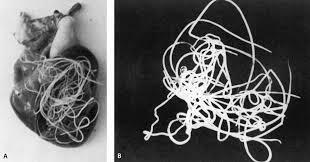 Infection with these nematodes, however, is independent of dog ownership, although residence in or travel to an area where canine dirofilariasis is endemic is almost universal among cases of human dirofilariasis. The use of anthelmintic chemotherapy is not routinely recommended after the removal of nodules. If secondary lesions are suspected or confirmed in deep body sites of abdomen & chest, a course of ivermectin and diethylcarbamazine may be advisable to prevent further invasive surgery. A course of chemotherapy may also be warranted after heavy exposure to mosquitoes in an area known to be endemic for dirofilariasis. A novel approach for the treatment of cardiopulmonary dirofilariosis is targeting the Wolbachia rickettsial endosymbionts. Treatment with tetracyclines has been reported to damage D immitis, even causing death of adult worms. 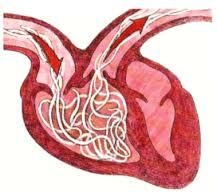 Long-lasting administration of both doxycycline and ivermectin before or in the place of melarsomine injections can eliminate adult worms and reduce the risk of thromboembolism.